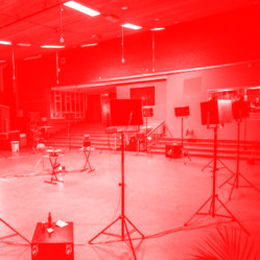 Already on Wednesday, 28 November at A4 – the Space for Contemporary Culture in Bratislava, eighteen loudspeakers will be heard in surround during the opening evening of the NEXT Festival for Contemporary Music. The special sound system was brought for the occasion from Amsterdam, but that is not all. Opening NEXT, A4 will stage the world premieres of three new electronic projects prepared by musicians from Slovakia, Korea and Mexico. At the opening of the 19th edition of NEXT Festival on 28 November, audiences will find themselves surrounded by the 18 loudspeakers that compose the ‘The Pentacle’ sound system. These were brought here from the Amsterdam-based institute STEIM – Studio for Electro-Instrumental Music, which for several decades now has supported artists in developing electronic musical instruments and multimedia installations. The festival’s unique opening evening will present four concerts with an international line-up. The new works were commissioned by A4 and the Dutch festival Sonic Acts as part of the several year-long international collaborative project Re-Imagine Europe, co-financed by the European Union’s Creative Europe programme, which joins A4 with nine other partner organisations and festivals. The project focuses on supporting new, experimental art that incorporates new technologies in innovative ways while critically reflecting on contemporary social and technological developments as well as on important global issues such as migration and climate change. Another Berlin resident, Mexican electronic producer Hugo Esquinca creates sonically intense music incorporating randomized processes. In his performance, which will take place in complete darkness, he is prepared to make full use of the sonic potential of the space and thoroughly vibrate the A4 venue. Korean composer Ji Youn Kang often draws inspiration from her native shamanic ritual tradition, and she also currently teaches spatial sound composition at the Institute of Sonology in the Hague. Her live sets promise an exotic blend of modified pieces of bamboo, a small Korean gong and an analogue electronic system in conjunction with the performer’s body. Each of these ‘instruments’ creates separate rhythmic voices with a peculiar character that will gradually fill the space with their joint ‘song and breadth’. Besides premieres during the opening evening, the potential of this unusual sound system will also be demonstrated by Dutchman Fedde ten Berge, who is also its co-creator. In addition to music, he also creates interactive sonic installations and objects. The new works will be first presented at NEXT in Bratislava and subsequently at the Sonic Acts exhibit in Amsterdam in February.